A low-end SUV can save you a lot of money, but if you’re going to be spending a ton of time driving around, it might be worth it to go upscale. For a little extra, you can get better features in a deluxe environment that you’ll never want to leave. It’ll be hard to slide out of the cabin of these five amazing luxury SUVs. If you want luxury, Bentley sure has what you desire. 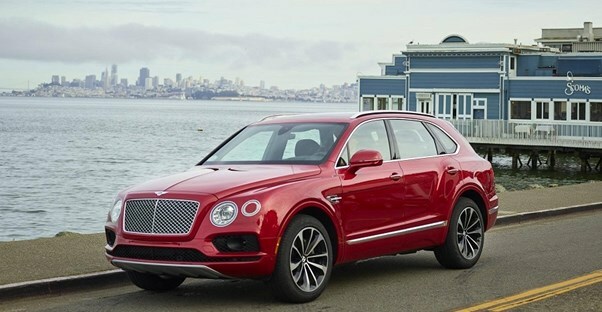 With a starting MSRP of $195,000, the Bentley Bentayga is well beyond the reach of everyday buyers looking for a mid-size SUV. But this is the luxury segment! Entering its second model year, the Bentayga continues to receive rave reviews from auto enthusiasts. It is one of the fastest production SUVs and has a top speed of 187 mph. Of course, all that speed won't do you any favors at the gas pump. The Bentayga receives poor fuel economy ratings of 12 mpg in the city and 19 mpg on the highway. But for nearly $200K, buyers aren't concerned with that. They'll be enjoying the finest leather seats, 22-inch wheels, 20-speaker audio system and carbon-fiber interior trim. The 2018 Porsche Cayenne is a brand-new third-generation design overhaul. Though it is still well within the luxury segment, the Cayenne has an MSRP less than half of the Bentayga's: $60,600. Even the E-Hybrid model starts at just under $80,000. Inside, drivers will immediately notice the massive 12.3-inch HD infotainment touchscreen. Handling and safety are where the Porsche really distances itself from the competition. Steady, sure driving is thanks to well-responsive steering and active anti-roll bars. For a mid-size SUV, the Cayenne handles like a vehicle much smaller. On the safety side, expect park assist technology, rear-view and surround cameras, and adaptive cruise control that features a stop-and-go function. Starting at $74,790, the 2018 Maserati Levante sits right in between the Bentley Bentayga and Porsche Cayenne when it comes to price. The Italian automaker truly knows how to craft a luxury mid-size SUV, owing to its third-place finish on our list. With a max speed of 156 mph and max power of 345 hp, even the base Levante is no slouch. At these high price points, it shouldn't come as a surprise that available options include silk interiors and wood trims around the cabin. One noted drawback is the notably small cargo space, particularly for this class of SUV. But is that really a driver's concern when you're buying a vehicle for its world-class handling, smooth ride, and expressive engine? The Lexus RX 350 is a no-brainer. Each year's upgrades make it better and better. Though it's a solidly mid-size luxury crossover, the RX 350 has been able to pull double duty since the 2017 model. By choosing the 350 L variant, buyers have a third seating row option, moving the Lexus SUV into full-size territory. Being a premium brand, there are no shortage of refinements here at a starting MSRP of $43,270. It features lush cabin materials, incredibly comfortable ride, and all the safety tech that could take advantage of. Not to mention, a 450h hybrid version ups the fuel economy to an impressive 31 mpg in the city and 28 mpg on the highway. The X5 has had some time on the market to improve. That being said, the 2018 model will be the last of the third generation body style. If you're looking for a mid-size luxury SUV in 2018 as opposed to 2019, the BMW X5 is still a great buy. At a starting MSRP $57,200, buyers will find 19-inch wheels, 300-hp engine with 8-speed Sprot Automatic transmission (including sport and manual shift modes), LED fog lights, xenon adaptive headlights, 14-way power front seats with 4-way lumbar support, poplar wood trim, 10.2" high-resolution touchscreen, rear-view camera, panoramic moonroof, and rain-sensing windshield wipers, among other features. If you think that laundry list is impressive, just imagine what the two other design levels and two further feature tiers contain!